Background: The aim of this study was to compare the cytotoxicity and the biocompatibility of three different nanofibers scaffolds after seeding of stem cells harvested from human deciduous dental pulp. Given the importance of scaffold and its features in tissue engineering, this study demonstrated the construction of polyhydroxybutyrate (PHB)/chitosan/nano-bioglass (nBG) nanocomposite scaffold using electrospinning method. Materials and Methods: This experimental study was conducted on normal exfoliated deciduous incisors obtained from 6-year-old to 11-year-old healthy children. The dental pulp was extracted from primary incisor teeth which are falling aseptically. After digesting the tissue with 4 mg/ml of type I collagenase, the cells were cultured in medium solution. Identification of stem cells from human exfoliated deciduous teeth was performed by flowcytometry using CD19, CD14, CD146, and CD90 markers. Then, 1 × 104 stem cells were seeded on the scaffold with a diameter of 10 mm × 0.3 mm. Cell viability was evaluated on days 3, 5, and 7 through methyl thiazol tetrazolium techniques (P < 0.05) on different groups that they are groups included (1) PHB scaffold (G1), (2) PHB/chitosan scaffold (G2), (3) the optimal PHB/chitosan/nBG scaffold (G3), (4) mineral trioxide aggregate (MTA), and (5) the G3 + MTA scaffold (G3 + MTA). Data were analyzed with two-way ANOVA at significance level of P < 0.05. Results: The results indicated that the PHB/chitosan/nBG scaffold and PHB/chitosan/nBG scaffold + MTA groups showed significant difference compared with the PHB/chitosan scaffold and PHB scaffold groups on the 7th day (P < 0.05). Conclusion: Thus, it can be concluded that the scaffold with nBG nanoparticles is more biocompatible than the other scaffolds and can be considered as a suitable scaffold for growth and proliferation of stem cells. In recent years, stem cell investigations have improved dramatically and this has been due to the recognition of the therapeutic potential of stem cells in improving patients with a wide variety of diseases. The promising therapeutic outcomes based on stem cells in the in vitro and in vivo animal models have reinforced speculation about the use of these cells in future therapeutic purposes in the human dentistry. According to the ability to repair and/or salvage of damaged tissue and restore the function of an organ, investments and researches have been developed on various types of stem or progenitor cells. Some of the dental tissues are rich sources of mesenchymal stem cells (MSCs), which are suitable for tissue engineering applications, because MSCs have the potential to differentiate into various types of cells, including odontoblasts, neural progenitor cells, osteoblasts,, chondrocytes (cartilage),,, and fat cells. Accordingly, the creative innovations have been made to produce a new generation of clinical materials or novel approaches and materials for tissue regeneration. The MSCs found in the dental tissues include dental pulp stem cells (DPSCs), dental papilla, dental follicle, exfoliated deciduous teeth, and periodontal ligament. These cells can be isolated, purified, and grown under certain tissue culture for tissue engineering purposes, such as restoration of teeth, nerves, and bone. Isolation of cells from tissue is a time-consuming and long-term process, but the length of this period can be drastically shortened using some compounds such as enzymes. In contrast, enzymes in some cases cause the extensive cell death., Enzymatic digestion is one of the most common methods for extracting cells from dental pulp, which is used today in many research centers in the world. In the enzymatic digestion, the pulp tissue is extracted from healthy and caries-free teeth of 6–11-year-old children and maintained in a suitable environment for cell isolation after digesting tissue and related operations. In the studies on dental pulp, the scientists suggested that dental pulp cells have perivascular origin because these cells express CD146 and CD90 markers, which are among the endothelial cell markers. Tsai et al. in 2017 isolated MSCs from the deciduous dental pulp. The results of flow cytometric analysis of specific markers showed positive expression of CD73, CD90, STRO-1, and CD44 and negative expression of CD34, CD19, and HLA-DR.
One of the important components of tissue engineering is scaffolds, which act as a suitable platform for cellular proliferation, growth, and differentiation. Polymer-based scaffolds are widely used in various medical branches due to their good hydrophilicity and flexibility. Polyhydroxybutyrate (PHB) is an artificial polymer weakened with the hydrolysis of ester bonds in physiological conditions and its attenuation releases acidic products that can be released. The biodegradable of PHB compared to other weakening polymers is slow and suitable for applications that require materials with durability. It has been shown that PHB has a low toxicity, which is partly due to its in vivo breakability or transformability. Of course, this polymer also has some flaws such as hydrophilia and low-degradation rate which can limit the use of this polymer in production of tissue engineering scaffolds.,, One way to deal with these flaws is to use it in combination with natural polymers. Chitosan is natural amino polysaccharides with polyhedral properties and wide-ranging biomedical and industrial applications. The chitosan is capable of supporting cell growth due to positively superficial charge, as well as facilitating cell adhesion, proliferation, and differentiation because of hydrophilicity; however, the chitosan mechanically is extremely weak and unstable., For this reason, biologically active materials such as hydroxyapatite, nano-bioglass (nBG), collagen, or gelatin in combination with chitosan have been developed to improve their mechanical or biological properties.,,,,, Bioactive glasses due to their ability in binding to the surrounding tissues have been widely studied so far. The produced glasses in this way have good conduction and induction of ossification. In addition, they can be prepared by controlled combination and high specific surface area for appropriate degradability. Mineral trioxide aggregate (MTA) has been proposed as material of choice for DPC procedures instead of calcium hydroxide because of its clinically easier use, less pulpal inflammation, and more predictable hard tissue barrier formation. Many studies have designed and constructed PHB scaffolds.,,, In one of the first studies, the researchers constructed three-dimensional scaffold made of alloy PHB/poly-(hydroxybutyrate-co-hydroxy valerate) (PHBV) by the electrospinning method. The prepared fiber scaffolds had more hydrophilicity than films made of the same material, which were prepared for comparison. Furthermore, alloy fibers showed higher tensile strength compared with pure PHB and PHBV fibers and were also suitable substrate for the proliferation of human osteoblast cells and L929 mouse fibroblasts. In another study, Daranarvng et al. constructed the composite scaffold of PHB/poly(L-lactide-co-ε-caprolactone) (PCL) by electrospinning that had the proper hydrophilic feature and high tensile strength compared to the PHB scaffolds. The cellular test results indicated potent adhesion and proliferation of olfactory ensheathing cells, as well as mitochondrial activity was increased. In another study, Veleirinho et al. 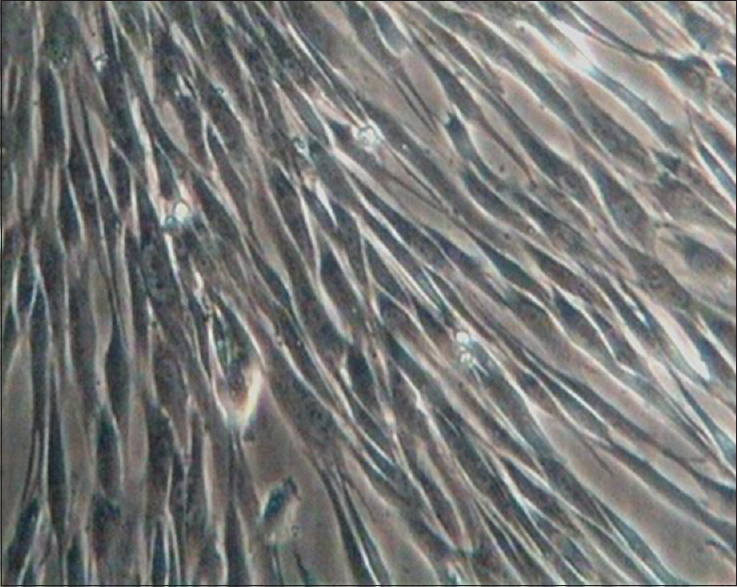 developed PHBV/chitosan scaffold through electrospinning technique for skin renewal and evaluated the fibroblast adhesion, cell survival, and proliferation using L929 cells. The scaffold showed a good performance in rat wound healing. Yang et al. in 2010 designed PCL/gelatin/nano-hydroxyapatite composite scaffold for performance evaluation of DPSCs. After in vitro and in vivo tests, they concluded that this scaffold is also a good substrate for proliferation of DPSCs and differentiation into odontoblast-like cells. Ramier et al. produced PHB/gelatin/nHA nanocomposite scaffold by electrospinning that increased the growth and proliferation of human MSCs (hMSCs) and enhanced osteogenic properties. Foroughi et al. in 2017 designed PHB/chitosan/nBG scaffold that revealed proper biocompatibility and mechanical outcomes. The aim of this study is to extract stem cells from human exfoliated deciduous (SHED) teeth and evaluate toxicity, growth rate, and proliferation of these cells on PHB/chitosan/nBG nanocomposite scaffold using electrospinning method. This experimental study was approved by the Isfahan University of Medical Sciences research and ethics committee (No. #394792). After synthesis of nBG powder by the melting method, used PHB polymer powder with a constant concentration of 9% by weight, which is obtained as the optimum percentage in the previous study. For the preparation of any desired concentration, a decent amount of PHB polymer was dissolved in trifluoroacetic acid (TFA) at a temperature of 40°C for 20 min. After complete dissolution of PHB in TFA, chitosan as the second component of the composite scaffold at the concentrations of 10, 15, and 20 wt% was added to the PHB polymer solution at 40°C for 20 min. Then, the bioactive glass nanoparticles with three 7.5, 10, and 15 wt% were added to the polymer/chitosan solution and again were placed on a stirrer for 30 min. Next, for better and uniform distribution of particles in solution and prevention of the particles agglomeration, the solution was stirred for 60 min by a homogenizer and immediately was electrospun under different conditions. To determine the effects of electrospinning parameters on the scaffolds, two important parameters affecting the fiber diameter, including electric potential of the device and the distance between the needle and collector plate, are considered as variable electrospinning parameters; in other words, two different values for the electrical potential difference (10 and 14 kV) and two different values for the distance between the needle and collector plate (7 and 14 cm). Composite solution (1 ml) after the preparation was injected by syringe into the device for spin, and then, electrospinning was carried out on aluminum foil. To study the morphology of electrospun scaffolds, the scaffold samples prepared with dimensions of 1 cm × 1 cm were assessed using a field emission scanning electron microscope (FE-SEM-Hitachi-SU 8230) in ×2000 and ×5000 magnification. Three healthy naturally fallen teeth (from three healthy children aged 6–11 years) were extracted and collected for MSCs. Two to five days before tooth extraction, patients underwent full health education and full professional prophylaxis of teeth by brushes and pumice dough to reduce the amount of plaque and debris as much as possible, and therefore, microbial contamination in the culture medium was minimized. On the day of extraction, professional prophylaxis was again performed for patients. After adequate local anesthetic injection, the patients rinsed their mouth with a 0.12% chlorhexidine mouthwash twice, each time for 1 min to minimize the chance of contamination of the culture medium. Tooth extraction was performed under sterile surgical procedures using sterile gloves, and after oral disinfection with iodine solution and immediately after extraction, the remaining pulp of the teeth was extracted by spoon excavator or endodontic files from the apical end of the analyzed root with minimum trauma with sterile equipment and immersed in a phosphate buffered saline (PBS) solution. After washing the teeth in PBS solution containing 1% antibiotic penicillin/streptomycin, the pulp tissue was removed from the teeth and washed again in the solution. For cell culture, the pulp tissue was placed in a solution of 4 mg/ml collagenase Type-I at 37°C. After 1 h, with pipetting, the lysed tissue was converted to single cell type and added to the medium containing α-MEM containing 15% ES-FSC and centrifuged for 10 min at 1200 rpm. The cell plate was mixed again with the medium and cultured after transfer to a suitable dish in an incubator at 37°C and 95% humidity. After 24 h, the floating cells were removed from the medium by washing the dish with PBS solution and the culture was continued in the same conditions to proliferate the cells. After filling the dish, the cell passage was performed using trypsin-ethylenediaminetetraacetic acid (EDTA), and eventually, the cell passage was conducted depending on the number of cells from each sample. For subsequent experiments, cells of the fourth passage were placed in a 10% DMSO medium and then transferred to the nitrogen tank. After proliferation of cells in the initial culture and occupying at least 80% of the flask floor, after 10–12 days, the cells were transported to several flasks. The passage steps were: the outer atmosphere of the T75 flask was evacuated; the cells were washed twice with 2 ml of PBS; 3 ml of trypsin-EDTA (Sigma) solution was added to the flask and placed at 37°C for 3 min; to stop the activity of trypsin enzyme, 3 ml of DMEM medium with 10% FBS was added to the flask; with pipetting, the cells separated from the flask floor were isolated and floated; the cell suspension was poured into 15 ml Falcon pipes and centrifuged for 8 min at 1400 rpm. Cellular deposition was placed in 1 ml suspension culture medium and then transferred into three T75 flasks containing 12 ml culture medium containing 10% PBS. Flasks were kept in an incubator at 37°C and 5% CO2[Figure 1]. Figure 1: The isolation steps of stem cells from human exfoliated deciduous teeth. The cells were isolated by flowcytometry. The markers used included CD19, CD14, CD146 and CD90. For this purpose, monolayer stem cells were fixed after trypsinating and counting in 4% paraformaldehyde solution and incubated with human antibody. After 30 min, the cells were washed with phosphate buffer saline and analyzed by flowcytometry. 1 × 105 cells were transferred in flowcytometry tubes after repeatedly washing and centrifugation. Next, about 10 μl of primary antibodies against surface markers of CD14, CD19, CD146, and CD90 were added to each tube. Monoclonal anti-CD90 (ab124527), monoclonal anti-CD146 (ab78451), monoclonal anti-CD14 (ab186689), and monoclonal anti-CD19 (ab24936) were prepared from Abcam Antibodies Cambridge Science Park, UK. The cells were incubated with antibody for 30 min in the dark at room temperature. The antibodies had been labeled with fluorescent agents of phycoerythrin and fluorescein isothiocyanate. The washing was done with buffer. After centrifugation, the cell pellet was suspended in 200 μl of buffer. The labeled cells were analyzed by FACS Calibur 488 (BD) flowcytometry. 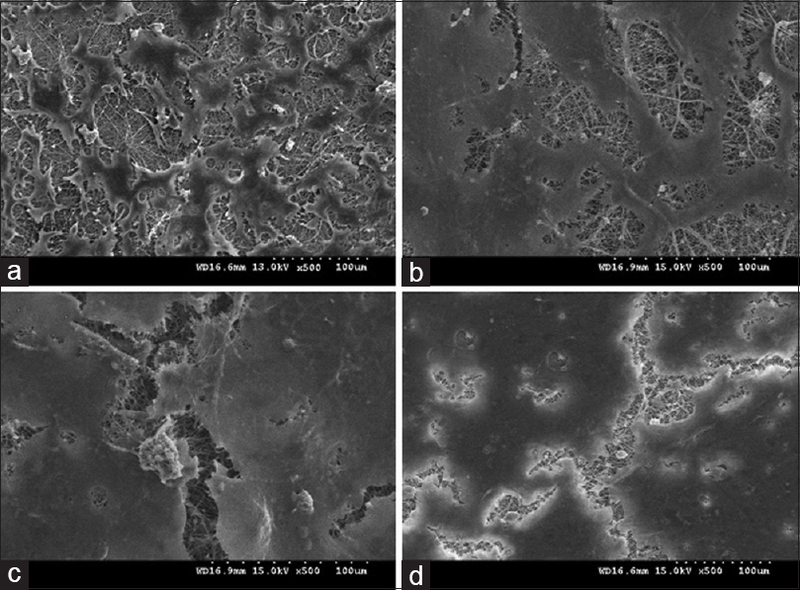 Three types of scaffolds including PHB, PHB/chitosan, and PHB/chitosan/nBG prepared by electrospinning were sterilized using 70% ethanol and washed three times with PBS solution inside the culture dishes. Before cell culture, the two sides of the scaffolds were sterilized by UV for 20 min. Finally, the samples were placed in 24-well plates in a sterile environment. 200 mg MTA powder (ProRoot MTA, Dentsply, USA) in 120 μl of deionized water was kept in conical tube for 24 h. Then, 50 μl of DMEM was added, and the mixture was stirred slowly during the day. To collect the MTA, the tube was centrifuged. New DMEM was poured into the tube and kept for more than 1 day. After centrifugation, the first and second extractions of MTA mixture were filtered by 0.2 μm filter. Following trypsinization of SHED, 2 × 104 cells from the third passage were transferred onto each scaffold. According to references, the scaffold had thickness of 0.3 mm and diameter of 10 mm; the scaffold was in 24-well plates. One milliliter of DMEM medium containing 10% serum and 1% penicillin/streptomycin was added to each well. After that, five groups included (1) PHB scaffold (G1), (2) PHB/chitosan scaffold (G2), (3) the optimal PHB/chitosan/nBG scaffold (G3), (4) MTA, and (5) the G3 + MTA scaffold (G3 + MTA). Cell culture was carried out in the periods of 3, 5, and 7 days with at least three replications. The methyl thiazol tetrazolium (MTT) assay was used to investigate the survival and proliferation of the cells on the scaffolds. This test examines mitochondrial dehydrogenase enzyme activity, and finally, the reduction level of tetrazolium as an indicator of cell growth. After passing the test times listed for MTT, discarding the medium, and washing with PBS, 400 μl of pure medium and 40ul of MTT solution (with concentration of 5 mg/ml Sigma Aldrich) were added to each well, which was incubated for 4 h. Then, the medium was emptied slowly, and 400 μl of DMSO was added and kept in darkness for 2 h at room temperature. After pippetage, 100 μl of solution was transferred to the wells of the 96-well plate. The optical density (OD) of samples was read at a wavelength of 540 nm via ELISA reader (Hiperion MPR 4 + Microplate reader). After removing the medium, the sample is seeded with SHED cells were washed twice in PBS solution. Next, the samples were fixed using glutaraldehyde 2.5% at the amount of 5 ml per sample. After cell fixation, the samples were dehydrated in ascending ethanol concentrations (70%, 90%, and 100%) for about 20 min at each concentration. Then, the samples were left in the environment to dry. After complete drying, the samples were mounted on copper bases and were coated with gold; next, their morphology were observed using SEM. Data were analyzed with IBM SPSS Statistics Version 21.0 using two-way ANOVA at significance level of P < 0.05. SEM image and histogram graph for nanocomposite scaffold samples are shown in [Figure 2]. Figure 2: Scanning electron microscope image and histogram graph of polyhydroxybutyrate/15Cht/10 nano-bioglass nanocomposite fiber. The cells were elongated and clustered under the microscopy of the contrast phase [Figure 3]. Figure 3: The morphology of stem cells from human exfoliated deciduous teeth in primary culture at 7th day (×100). The analysis of flow cytometric results showed that the cells isolated from the pulp of deciduous teeth were positive for mesenchymal CD90 and CD146 markers while were negative for hematopoietic CD14 and CD19 markers. The results are shown in the graphs of [Figure 4]. 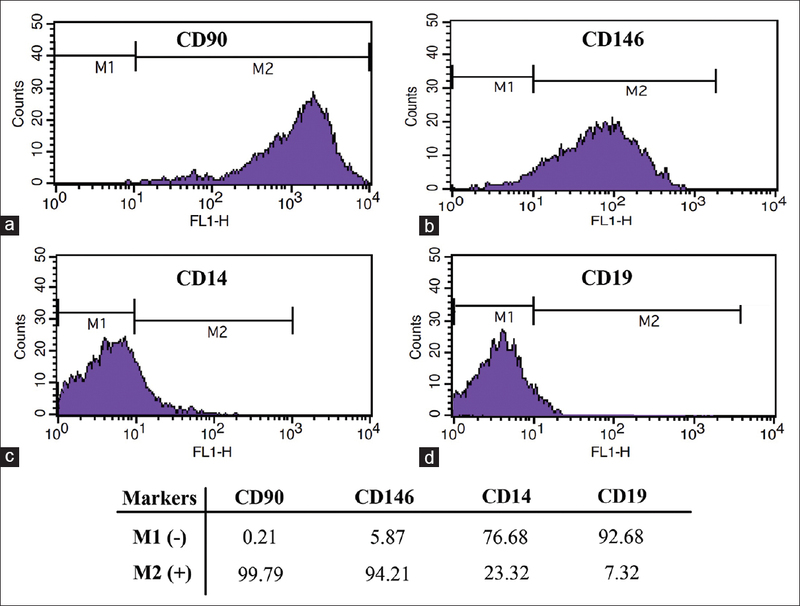 Figure 4: The results of flowcytometry for human deciduous teeth cells; (a) CD90, (b) CD146, (c) CD14, and (d) CD19. The MTT assay was used to confirm the activity and growth and proliferation of cells on the nanofibers used and the amount of scaffold toxicity, and the absorbance of the OD of the samples was read by the ELISA reader spectrophotometer. The variation in the growth rate of cells in the scaffolds and cell viability percentage (equation 1) has been shown on the 1st, 5th, and 7th day. The results of MTT assay was plotted on a graph within relevant intervals. The MTT assay mechanism is shown in [Figure 5]. Figure 5: The results of methyl thiazol tetrazolium assay and comparison of cell viability percentage on scaffolds (n = 3); (a) 3rd day, (b) 5th day, and (c) 7th day, significant difference was observed between scaffolding groups (G) *(P < 0.05). The nanofiber scaffolds are physically mimic the extracellular matrix and could be a suitable substrate for cell adhesion and growth. 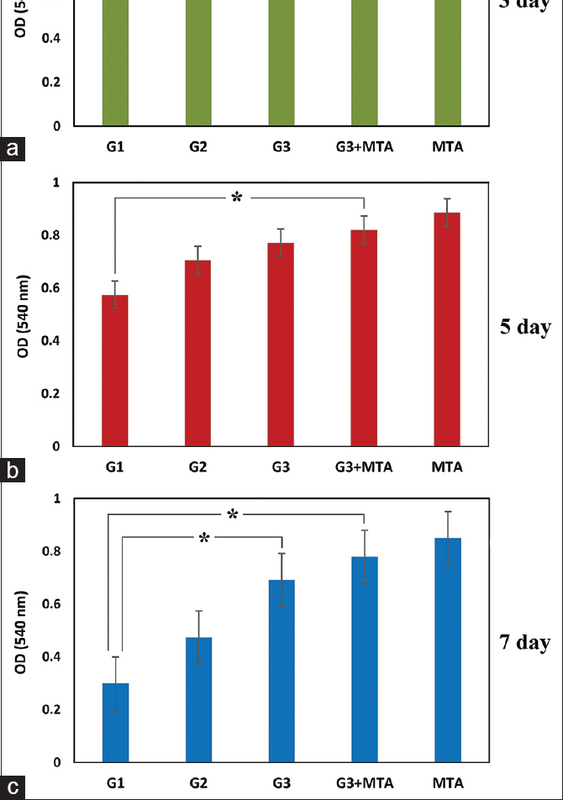 For this purpose, the MTT assay was performed in cultured SHED cells on 3, 5, and 7 days on the scaffold [Figure 5]. Consequently, the difference between the groups was significant (P< 0.05). However, according to the results of biocompatibility tests carried out earlier, G3 composition containing chitosan and nBG had good biocompatibility and could be proper substrate for cell growth and proliferation. Thus, it can be stated that the growth and proliferation of SHED cells can be a function of chemical (hydrophilicity) and structural (porosity and size of fibers) properties of the scaffolds, and if this feature is better, cell adhesion and growth will be better. Maximum cell viability percentage was related to the G3 + MTA and G3 groups and G1 and G2 groups. There was no statistically significant difference between the two G3 + MTA and G3 groups in terms of cell viability percentage (P > 0.05), while the two groups had statistically significant difference with G1 sample, likely due to the presence of carboxylated amine groups in the chitosan structure that causes improvement in hydrophilic substrate and thus better growth of metabolically active cells on G3 + MTA and G3 scaffolds compared to G1 sample. According to [Figure 5], there was no significant difference between the groups on 3th day (P > 0.05). However, this significant difference was observed on the 5th day in the group G1 and there was a significant difference between the G1 group and G3 and G3 + MTA groups on the 7th day. According to the results of the assessment of cell viability percentage, the scaffolds containing MTA and nBG nanoparticles had far more cell viability percentage compared to scaffolds without nanoparticles. Therefore, it can be concluded that the nBG nanoparticles have an important role in cell growth and adhesion. The suitability of three-dimensional composite scaffolds for cell culture was determined by observing the cell morphology and proliferation using SEM images. High adhesion and proliferation of cells on the scaffolds are visible in the SEM images as shown in [Figure 6]. This is the result of appropriate physicochemical properties and cell compatibility of the scaffolds. The cell adhesion was enhanced with increasing the concentration of gelatin. In addition, the nBG nanoparticles play a key role in SHED cell adhesion on composite scaffolds. [Figure 6]c and d clearly shows that the adhesion of these cells is stronger compared to the G1 and G2 groups. Figure 6: Evaluation of morphology and adhesion of cells on the scaffolds' surface (a) G1, (b) G2, (c) G3, and (d) G3 + MTA (×500). MTA: Mineral trioxide aggregate. The tensile force is increased at the time of fibrillation, and thus, fiber diameter is reduced. This phenomenon compared with pure PHB sample can be observed in [Figure 2]. In this image, a highly porous network of agglomerated fiber without nodes can be seen. The presence of ionic groups in the polymer structure of nBG nanoparticles increases the electrical conductivity of the solution. This can move further electric charges and can eventually lead to stretching and narrowing of the fibers and reduce their distribution. In general, the polymer solution drops out of the needle are deformed under the influence of an electric field and turn to Taylor cone shape. However, solutions with high electrical properties can move further electric charges and can eventually lead to stretching and narrowing of the fibers and reduce their distribution. The living cells extracted from the dental pulp tissue in the 7th day after starting the culture were visible at the bottom of the flask with the appearance of fibroblasts cells using phase contrast microscopy. The cell density was elevated progressively with increasing cultivation time [Figure 3]. According to [Figure 4], the expression level of positive CD90 and CD146 markers was 99.79 and 94.21%, respectively; and the expression level of hematopoietic CD14 and CD19 markers was 23.32 and 7.32%, respectively. In studies on dental pulp, scientists have suggested the perivascular origin of dental pulp cells because these cells express the CD146 and CD90 markers. There is only one type of undifferentiated cells in dental pulp, which can be differentiated into other cells. Due to the confined space of the pulp chamber and very narrow root canals, it can be concluded that all dental pulp cells are stem cells.,, Evaluation of surface markers of developed cells using flowcytometry showed that these cells were positive for CD90 and CD146 markers and were negative for CD14 and CD19 markers. The CD14 and CD19 are markers for endothelial progenitor cells, while the CD90 and CD146 are markers for stem cells. Thus, it can be said that these extracted stem cells are probably pluripotent. Previous studies provided by Miura et al. revealed that ex vivo developed SHEDs express primary mesenchymal markers (STRO1). However, contrary to the results of the present study, the cells were positive (CD146) for endothelial progenitor cells. In this study, the cells positive for STRO1 and CD146 were also accumulated around the blood vessels of remaining pulp. They concluded that the origin of these cells is likely perivascular microenvironment. Alipour et al. have been compared SHED and adipose-derived stem cells in terms of surface markers; the results of MSCs could be isolated and cultured successfully from dental pulp of human exfoliated deciduous teeth; they are very good candidates for the treatment and prevention of human diseases. This study examined initially PHB/chitosan/nBG nanocomposite scaffold using electrospinning method. According to the results, the achieved scaffold has appropriate mechanical properties and bioactivity due to the presence of chitosan and nBG nanoparticles. Given the SEM results, the size of synthesized nBG nanoparticles is between 35 and 55 nm. On the other hand, the nBG particles cause the proper distribution of particles to electrospinning in the solution containing the polymer. It is worth mentioning, the solution has hardly electrospinning capabilities by increasing nBG nanoparticles about 15 wt% and chitosan about 20 wt%, and agglomerated nanoparticles are seen on the surface of the fibers. On the other hand, the analysis of flow cytometric results showed that the cells isolated from the pulp of deciduous teeth were positive for mesenchymal CD90 and CD146 markers, while were negative for hematopoietic CD14 and CD19 markers. The SEM images demonstrated high adhesion and proliferation of cells on the scaffolds, representing proper compatibility of the scaffold in terms of noncytotoxic property. The present research project was sponsored by the Isfahan University of Medical Sciences (No. #394792). We appreciate the staff of the Dental Materials Research Center and Torabinejad Dentistry Research Center. The authors of this manuscript declare that they have no conflicts of interest, real or perceived, financial or non-financial in this article. Leo AJ, Grande DA. Mesenchymal stem cells in tissue engineering. Cells Tissues Organs 2006;183:112-22.1. Nardi NB, da Silva Meirelles L. Mesenchymal stem cells: Isolation, in vitro expansion and characterization. In: Wobus A.M., Boheler K.R. (eds) Stem Cells. Handbook of Experimental Pharmacology, Springer, Berlin, Heidelberg 2008;174:249-82. Kim EY, Lee KB, Yu J, Lee JH, Kim KJ, Han KW, et al. Neuronal cell differentiation of mesenchymal stem cells originating from canine amniotic fluid. Hum Cell 2014;27:51-8. Brighton CT, Hunt RM. Early histological and ultrastructural changes in medullary fracture callus. J Bone Joint Surg Am 1991;73:832-47. Kabiri A, Esfandiari E, Hashemibeni B, Kazemi M, Mardani M, Esmaeili A, et al. Effects of FGF-2 on human adipose tissue derived adult stem cells morphology and chondrogenesis enhancement in transwell culture. Biochem Biophys Res Commun 2012;424:234-8. Brighton CT, Hunt RM. Early histologic and ultrastructural changes in microvessels of periosteal callus. J Orthop Trauma 1997;11:244-53. Kabiri A, Esfandiari E, Esmaeili A, Hashemibeni B, Pourazar A, Mardani M, et al. Platelet-rich plasma application in chondrogenesis. Adv Biomed Res 2014;3:138. Ledesma-Martínez E, Mendoza-Núñez VM, Santiago-Osorio E. Mesenchymal stem cells derived from dental pulp: A review. Stem Cells Int 2016;2016:4709572. Estrela C, Alencar AH, Kitten GT, Vencio EF, Gava E. Mesenchymal stem cells in the dental tissues: Perspectives for tissue regeneration. Braz Dent J 2011;22:91-8. Huang GT, Sonoyama W, Chen J, Park SH.In vitro characterization of human dental pulp cells: Various isolation methods and culturing environments. Cell Tissue Res 2006;324:225-36. Lopez-Cazaux S, Bluteau G, Magne D, Lieubeau B, Guicheux J, Alliot-Licht B, et al. Culture medium modulates the behaviour of human dental pulp-derived cells: Technical note. Eur Cell Mater 2006;11:35-42. Tsai AI, Hong HH, Lin WR, Fu JF, Chang CC, Wang IK, et al. Isolation of mesenchymal stem cells from human deciduous teeth pulp. Biomed Res Int 2017;2017:2851906. Adler J, Jayan A, Melia CD. A method for quantifying differential expansion within hydrating hydrophilic matrixes by tracking embedded fluorescent microspheres. J Pharm Sci 1999;88:371-7. Pachekoski WM, Agnelli JA, Belem LP. Thermal, mechanical and morphological properties of poly (hydroxybutyrate) and polypropylene blends after processing. Mater Res 2009;12:159-64. Doyle C, Tanner ET, Bonfield W.In vitro and in vivo evaluation of polyhydroxybutyrate and of polyhydroxybutyrate reinforced with hydroxyapatite. Biomaterials 1991;12:841-7. Luklinska ZB, Schluckwerder H.In vivo response to HA-polyhydroxybutyrate/polyhydroxyvalerate composite. J Microsc 2003;211:121-9. Kumar MN. A review of chitin and chitosan applications. React Funct Polym 2000;46:1-27. Croisier F, Jérôme C. Chitosan-based biomaterials for tissue engineering. Eur Polym J 2013;49:780-92. Knaul JZ, Hudson SM, Creber KA. Improved mechanical properties of chitosan fibers. J Appl Polym Sci 1999;72:1721-32. Aliasghari A, Rabbani Khorasgani M, Vaezifar S, Rahimi F, Younesi H, Khoroushi M, et al. Evaluation of antibacterial efficiency of chitosan and chitosan nanoparticles on cariogenic streptococci: An in vitro study. Iran J Microbiol 2016;8:93-100. Foroughi MR, Karbasi S, Ebrahimi-Kahrizsangi R. Physical and mechanical properties of a poly-3-hydroxybutyrate-coated nanocrystalline hydroxyapatite scaffold for bone tissue engineering. J Porous Mater 2012;19:667-75. Foroughi MR, Karbasi S, Khoroushi M, Khademi AA. Polyhydroxybutyrate/chitosan/bioglass nanocomposite as a novel electrospun scaffold: Fabrication and characterization. J Porous Mater 2017;24:1-14. Monshi A, Foroughi MR, Monshi MR. Modified Scherrer equation to estimate more accurately nano-crystallite size using XRD. World J Nano Sci Eng 2012;2:154. Mehdikhani-Nahrkhalaji M, Fathi MH, Mortazavi V, Mousavi SB, Hashemi-Beni B, Razavi SM, et al. Novel nanocomposite coating for dental implant applications in vitro and in vivo evaluation. J Mater Sci Mater Med 2012;23:485-95. Hashemibeni B, Dehghani L, Sadeghi F, Esfandiari E, Gorbani M, Akhavan A, et al. Bone repair with differentiated osteoblasts from adipose-derived stem cells in hydroxyapatite/Tricalcium phosphate in vivo. Int J Prev Med 2016;7:62. Khoroushi M, Eshghi A, Naderibeni F. Pit and fissure sealant retention following air abrasion preparation with bioactive glass and aluminum oxide particles. J Dent Child (Chic) 2016;83:132-8. Mousavi SA, Ghoddusi J, Mohtasham N, Shahnaseri S, Paymanpour P, Kinoshita J, et al. Human pulp response to direct pulp capping and miniature pulpotomy with MTA after application of topical dexamethasone: A Randomized clinical trial. Iran Endod J 2016;11:85-90. Loty C, Sautier JM, Tan MT, Oboeuf M, Jallot E, Boulekbache H, et al. Bioactive glass stimulates in vitro osteoblast differentiation and creates a favorable template for bone tissue formation. J Bone Miner Res 2001;16:231-9. Foroughi M, Karbasi S, Sassan SH, editors. Bioactivity Evaluation of Nano-Crystalline Hydroxyapatite Scaffolds Coated with Poly-3-Hydroxybutyrate. Proceedings of the 4th International Conference on Nanostructures; 2012. Karbasi S, Zarei M, Foroughi M. Effects of Multi-Wall carbon Nano-Tubes (MWNTs) on structural and mechanical properties of electrospun poly (3-hydroxybutyrate) scaffold for tissue engineering applications. Sci Iran Trans F Nanotechnol 2016;23:3145-52. Montazeri M, Karbasi S, Foroughi MR, Monshi A, Ebrahimi-Kahrizsangi R. Evaluation of mechanical property and bioactivity of nano-bioglass 45S5 scaffold coated with poly-3-hydroxybutyrate. J Mater Sci Mater Med 2015;26:62. Sombatmankhong K, Suwantong O, Waleetorncheepsawat S, Supaphol P. Electrospun fiber mats of poly (3-hydroxybutyrate), poly (3-hydroxybutyrate-co-3-hydroxyvalerate), and their blends. J Polym Sci B Polym Phys 2006;44:2923-33. Daranarong D, Chan RT, Wanandy NS, Molloy R, Punyodom W, Foster LJ. Electrospun polyhydroxybutyrate and poly (L-lactide-co-ε-caprolactone) composites as nanofibrous scaffolds. Biomed Res Int 2014;2014:1-13. Veleirinho B, Coelho DS, Dias PF, Maraschin M, Ribeiro-do-Valle RM, Lopes-da-Silva JA, et al. Nanofibrous poly (3-hydroxybutyrate-co-3-hydroxyvalerate)/chitosan scaffolds for skin regeneration. Int J Biol Macromol 2012;51:343-50. Yang X, Yang F, Walboomers XF, Bian Z, Fan M, Jansen JA, et al. The performance of dental pulp stem cells on nanofibrous PCL/gelatin/nHA scaffolds. J Biomed Mater Res A 2010;93:247-57. Ramier J, Grande D, Bouderlique T, Stoilova O, Manolova N, Rashkov I, et al. From design of bio-based biocomposite electrospun scaffolds to osteogenic differentiation of human mesenchymal stromal cells. J Mater Sci Mater Med 2014;25:1563-75. Zuk PA, Zhu M, Ashjian P, De Ugarte DA, Huang JI, Mizuno H, et al. Human adipose tissue is a source of multipotent stem cells. Mol Biol Cell 2002;13:4279-95. Zhang Y, Ouyang H, Lim CT, Ramakrishna S, Huang ZM. Electrospinning of gelatin fibers and gelatin/PCL composite fibrous scaffolds. J Biomed Mater Res B Appl Biomater 2005;72:156-65. Shalak R, Fox C. Tissue Engineering. New York: Alan R Liss; 1998. Morsczeck C, Götz W, Schierholz J, Zeilhofer F, Kühn U, Möhl C, et al. Isolation of precursor cells (PCs) from human dental follicle of wisdom teeth. Matrix Biol 2005;24:155-65. Peng L, Ye L, Zhou XD. Mesenchymal stem cells and tooth engineering. Int J Oral Sci 2009;1:6-12. Bluteau G, Luder HU, De Bari C, Mitsiadis TA. Stem cells for tooth engineering. Eur Cell Mater 2008;16:1-9. Ribatti D, Finato N, Crivellato E, Marzullo A, Mangieri D, Nico B, et al. Neovascularization and mast cells with tryptase activity increase simultaneously with pathologic progression in human endometrial cancer. Am J Obstet Gynecol 2005;193:1961-5. Dominici M, Le Blanc K, Mueller I, Slaper-Cortenbach I, Marini F, Krause D, et al. Minimal criteria for defining multipotent mesenchymal stromal cells. The international society for cellular therapy position statement. Cytotherapy 2006;8:315-7. Alipour R, Sadeghi F, Hashemi-Beni B, Zarkesh-Esfahani SH, Heydari F, Mousavi SB, et al. Phenotypic characterizations and comparison of adult dental stem cells with adipose-derived stem cells. Int J Prev Med 2010;1:164-71.